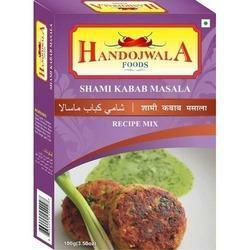 We are offering Shami Kabab Masala to our clients. Owing to our state-of-art manufacturing unit and the usage of cutting-edge techniques, we are able to present a comprehensive range of Kabab Masala. Sanjeev Kapoor's - "Seekh Kebab Tikka Masala"
We are a renowned company that deals in providing Instant Kabab Masala. 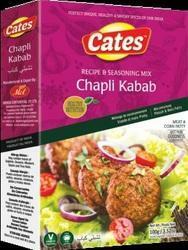 We are able to process best quality instant kabab masala which increase the taste of kabab. Our professionals use only healthy ingredients in preparing of these masalas. In addition to this, these are widely appreciated by our customer for their long life. Can be used to make mouyh watering Tandoori dishes, Tandoori dishes and Kebabs. We are involved in offering Seekh Kabab Masala to the customers. Moreover, these products are prepared using fresh ingredients. - Coriander seeds, red chilli, cumin, cinnamon, mustard, green cardamom, garlic, ginger, black pepper, clove, asafoetida, anise, nutmeg, mace, onion , curry leaves, star anise, bay leaf, kashmiri chilli, black salt, black cardamom, corn starch and salt.